More pictures below. High qualtiy Cosmos trike with floats & a 912S for an unbelievable price. Click on the picture for additional pictures & details. This Cosmos Phase-3 package is one of only a few in the world and offers an excellent price & opportunity to acquire the all the versatility you're after. Cosmos is supported here in the US for the transition to Sport Pilot and N-numbering this trike. It would be perfect for a water-based commercial operation in a tourism district or a very well-equipped recreational aircraft. We are willing to sell this machine without the floats if necessary and are obviously offering a discount because of it's history as described below. There are too many pictures & bits of information to fit on this website, but click on the picture to read more about the basic history & configuration of this aircraft. Cosmos is a well-finished, fine quality, & great flying float-trike. They are light, strong, and easy to handle in the water from setup to actual flight or even trailering. The quality of materials & workmanship is perfect for water use. This trike is completely Saltwater Treated & the engine has been Waterproofed by Rotax. Here's the trikes history: In our opinion, an inexperienced pilot was taken advantage of by the old Cosmos importer, Don Reinhard, in several ways but the final result was incomplete training coupled with dragging a wingtip in the water, followed by one float, a big splash, and over $62,580 down the drain along with this gentleman's dream. The trike was not damaged too badly (we have pictures to prove this) but the client's wife observed the accident and he 'abandoned ship' on the sport completely. We purchased the trike and have completely rebuilt this aircraft beyond new condition and will stand behind it in both service & support. We then sold the aircraft to a well known author who tipped it over in a crosswind and bent the engine mount. He made a solid decision to purchase a brand new 2006 airframe. And so we did. This trike is a brand new machine. The old airframe and 90% of the parts we replaced can still be used as spares but our intentions were to build the aircraft back to, with out a doubt, better than new. The process has been professionally documented with all original invoices, documents, letters, and digital photos. All of which will become property of the new owner. The whole aircraft, including engine, has been tested for over 20 hours and really flies nice; this accident was a real shame. The wing was not harmed and is confirmed & documented by Northwing Design. By the way, the wing is a Strutted/Folding 17.5 Northwing so it can stay on the trike & fold at the dock or before being trailered. This is not possible with conventional wings. We will gladly outfit this aircraft with another wing should the new owner request such pending his/her intentions but this is a great combination. 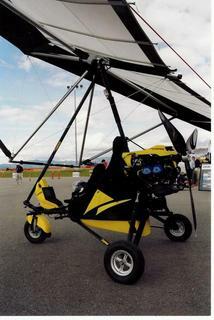 This aircraft has every option available to the ultralight trike industry including a BRS 1200 and all the electronics. Again, there are enough spare parts to build another trike. We have aircraft to fit all types of pilots, but serious inquiries & offers will be appreciated on this one. We can deliver within all 50 states or ship globally. We can also provide an elite level of instruction in a one-on-one basis at your location or ours. Although this aircraft has been completely restored, we realize it will never bring the market price that was paid. The owner is offering a substantial discount because of it's history and he has already purchased another 912 trike while this one was being rebuilt. We would be willing to discuss any fair offer with or without the floats. If you are not set on a 912(S), yet desire floats, we have a new Rotax 582dcdi in stock that could be fitted to this aircraft for an even more substantial decrease in price. What we're saying is that if you are seriously interested, please call and we'll discuss options. There are only 45 hours Total Time on this aircraft. Sad, isn't it?